Will be posted here the latest build of PON, past official 1.04. This will be a rather heavy archive, because baring a few configurations files that are generated automatically, plus your private and personal settings file, you get almost a full setup. The missing files are there to ensure you have a legit copy of PON. This is done this way so were are sure there is no issue coming from a missing or misplaced file, as official 1.04 is suspected to leave some files behind. Sadly, some of us we dead busy and the fixes on historical events or missing data in the GC will have to wait next week. But we will get you another QF next week, baring major disasters. a) go to the directory where PON is installed. Some differences graphically with: milit2 and milit3 png's. I would use this as a guide to moving files from an older installation to your new 1.04 installation- one caveat being, that some of these files may not even be used; whereas the Industry related one's we know for certain are indeed missing. The Folders that I don't list the missing file contents I can zip up per request- would need a day or two to make that available however. I was overjoyed when I was able to install it. I started and enjoyed the Franco Prussian War DLC without problem. But when I started a new 1850 campaign as France, I found that the same units that were missing before the quickfix are still missing. The French Foreign Legion, the French Light infantry corps, some divisions, etc. And there is still no way to recruit them. I hope these missing files, perhaps all the files listed by Prussia above, can be restored. My installation of the latest 1.04 quickfix worked well. See the screenshot below: France can recruit the foreign legion, and light infantry corps and the other units as well. All (OK, I checked only 50%) of the images listed to be missing by Prussia, are not part of the 1.04 quickfix, but they are present in my current game folder, so they must be placed there with the installation of an earlier version of the game. However, I don't remember anymore whether I installed the 1.04 quickfix over my 1.04 beta patch, or over a clean installation from the CD which I bought in 2011. Siegfroh, I installed the quickfix, the quickfix version number shows on the screen when the game loads, and the French cannot recruit the Foreign legion, and the units are missing as described above. However, I installed directly over my existing installation of PON, the one that had the official 1.04 patch installed. It appears that your installation, whether over the beta patch or the cd, did not have the defective 1.04 official patch which deleted files from the game. But mine did, and therein lies the problem. It seems to me that the most practical way to fix it for those of us who installed the official patch and lack computer skills is to have all the missing files added into the next quick fix. vaalen wrote: However, I installed directly over my existing installation of PON, the one that had the official 1.04 patch installed. Now I see the problem. The easiest solution would be to re-install the original game, and then apply the 1.04 quickfix on it. Or install the 1.04 beta patch over your existing game, and then apply the 1.04 quickfix on it. Or wait for the next patch, announed for this week ("baring major disasters"), which will include the 1.04 quickfix, "the fixes on historical events or missing data in the GC", and maybe also all the files which had been erroneously deleted by the official 1.04 patch. Siegfroh wrote: Now I see the problem. The easiest solution would be to re-install the original game, and then apply the 1.04 quickfix on it. By reinstalling the original game, do you mean to just install it over the existing installation? Would installing the 1.04 beta patch over my existing installation restore the missing files? Please forgive my ignorance, I know very little about computers. Thank you for your help, which is very much appreciated. Re-thinking, I would recommend now, for being sure that the missing files are restored (I don't know whether they are included in the 1.04 beta patch), to reinstall the original game. Either in a new folder, or over your existing installation. This shouldn't make a difference. The 1.04 quickfix contains (should contain) all the files which have been changed since the initial release. So if you apply it on your reinstallation of the original game, it will update all the files, but leave those untouched (or replace them with identical copies) which have not been changed since 2011. So to get back all the files deleted by the 1.04 official patch, you will have to reinstall the original 2011 game. Installing the 1.04 quickfix over this 2011 version of the game, will upgrade your installation to the complete and working latest version. Thank you for your clear and effective explanation, Siegfroh. I will choose one of the alternatives you outlined. I appear to have the same issue as vaalen as I reinstalled the game from scratch and then installed just the 1.04 quick fix and nothing else. I see 1.04.1 September 23, 2016 when I start the game. I can't recruit the French Foreign Legion either. I think I will just wait for the next patch which hopefully will fix everything. I believe many of the files reported as missing are not used. For example the extra modes. What you have in PON are all the modes you are going to use. I'm surprised though that some events are gone! The ability to build Foreign Legion units is also missing in my from-scratch PON v1.041 installation. With AI aggression set to normal there were some seventeen CB's issued to player-controlled France and the assorted AI powers from various factions after Turn-1 of a new 1850 GC. I don't recall CBs being this prolific in earlier versions but could be mistaken. One thing I noticed that seems new (never noticed this before) when selecting countries to buy from within a trade region box, the minor countries are ganged together, i.e. if I select Papal States Fish it will select Two Siciies as well, and not show the cumulative on the Assets Balance Window. Never recall seeing this happen before. you are right - that is different. its showing the trading unit as the region not the individual states. You can probably still ensure you trade with a particular state in a region via the direct state-state trade options? How do I do that? I thought selecting the individual state within a Trade Region is the "direct state-state trade options". Whilst the Asset Balance Window would allow the regional-state option. You can't do this any longer. 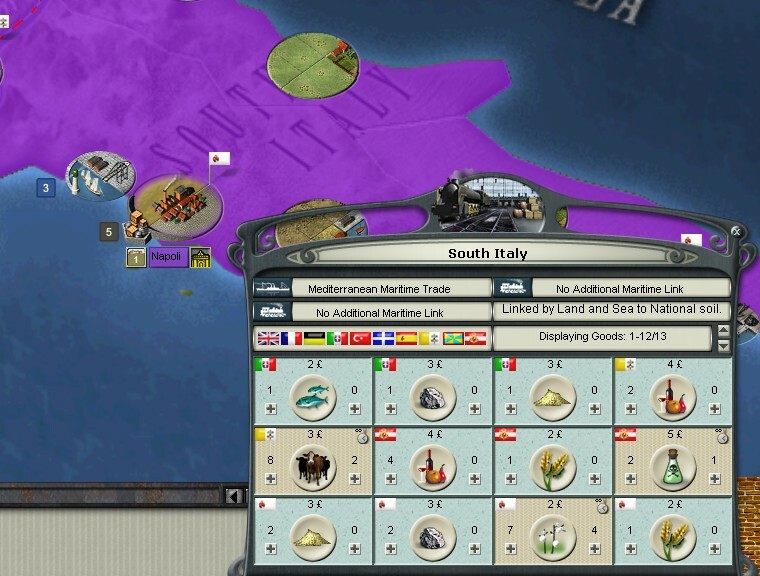 If, for example, in your screenshot you select to buy 1 quantity of Cereals from Parma, automaticaly 1 quantity of Cereals form Napoli are selected as well. If you disselect one, both purchase orders disappear. However, in the B-Screen, the expected purchases of Cereals in the next round always go up, or down, by 1 quantity only (or by higher quantities, if the quantities of goods offered allows). It is as if the foreign states in a given trade box always form a sales cartel. An unexpected twist of the code, I did not program that specifically. Pocus wrote: An unexpected twist of the code, I did not program that specifically. That's te future: games which develop and improve themselves ;-) Can it be retwisted ? If two countries offer different quantities of a good (5 and 13 Wood in the example below), the quantityy of the buy order a can be increased up to the sum of them all. If the high price option is selcted, it is selected for all states selling that good. And, by the way, the problem with the Caribbean Maritime Trade box, outlined at the link below, has been solved. However, with the South Andes Trade area (South Pacific Maritime Trade box), it still prevails. I haven't checked for the other Maritime Trade boxes. intend to delete decisions or make it impossible to recruit the French Foreign Legion. Yet these things happened with the official patch, and have not been fixed with the quick fix. And I am certain that PHilthib would never do these things, either. Just speculation, but it is hard to believe that files would just delete themselves. That's exactly the screen I use, and where the issue lies. Either being very clever or very lazy I have programmed my Razer Naga side panel keys for F4, T, B, and Shift. Which makes it very ritualistic and easy to pop all the Commerce/Industry/Production screens each turn. You had me scared in thinking I had completely missed something. sorry about that - should have done the next test and checked if it worked as I remembered. I recall using the ability to pick my supplier say in the Balkans where I was smooching the Greeks so wanted to set up a close trading relationship with them. A very scary sight when you are just starting out. here's the problem, just get a message "le téléchargement n'est plus disponible"
it has - latest patch includes all the unofficial changes as well as a lot of code changes.